The Board of Directors of Prime Bank Limited in a recent meeting unanimously elected Mr. Md. 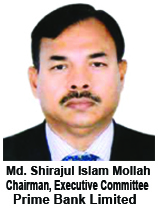 Shirajul Islam Mollah, M.P as the Chairman of the Executive Committee of the Board. Mr. Md. Shirajul Islam Mollah is a Sponsor Director of the Bank. As a renowned businessman, Mr. Mollah is the Managing Director of China-Bangla Ceramic Industries Limited, Bengal Tiger Cement Industries Limited, Bajnabo Textile Mills Limited, United Shipping Lines Limited. Widely travelled, Mr. Shirajul Islam Mollah is involved with various social and educational activities and earned recognitions from a number of organizations. He is the founder of Bajnabo Abul Faiz Mollah High School, Shibpur, Narsingdi. A philanthropist, Mr. Md. Shirajul Islam Mollah is also the Chairman of “Shirajul Islam Mollah Samaj Seba Foundation”. Mr. Mollah is an elected Member of Parliament from Narshingdi-3 and also a member of Dhaka Stock Exchange (DSE).